The question, he says, shouldn't be "Do you want a data plan?" Instead it should be "Do you want Facebook or Whatsapp?" Kirkpatrick likens it to a gateway drug... but then quickly switched back to the more euphemistic "on-ramp." "I really believe that it [spending money on the internet] really is the rational thing to do" says Zuckerberg. Kirkpatrick now asks whether Globe, the provider, is really making more money. 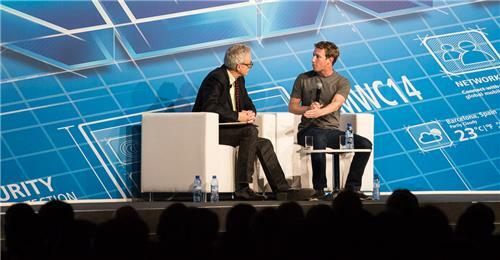 Zuckerberg says it's only been three or four months, so doubling data consumption is impressive. But, in terms of profits, they're "near break-even." "From what we've seen in the rate of improvement we're going to get this to a point where it's highly profitable." Zuckerberg says they want a few more partners, three or five, to start rolling this out a bit more broadly and help to refine the business model. "What we want to do for the next set of partnerships is where we really dive in for a year... My goal is to show that the model works over a full year, and then be back here next year or the year after with a systematic model." Kirkpatrick: "Is this just a way for Facebook to make more money, then?" Zuckerberg: "One of the unfair economic realities is that the people with the vast majority of the wealth are the people who are already on Facebook." Zuckerberg's board is asking the same question, how will this be profitable, and in the short-term, no, it won't be profitable. "But, I believe in this because first of all this is why I started Facebook... I built the product originally because I wanted it at Harvard. But the vision was that some day someone would try to connect everyone in the world." Background: Globe is the second largest telco in the Philippines, and the Philippines recently surveyed as the poorest, slowest mobile network in the world. "I think we're probably going to lose money on this for quite awhile." 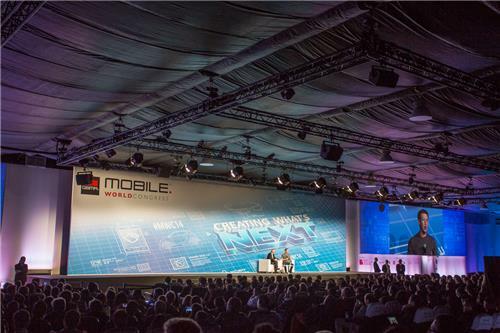 Every Mobile World Congress I've been to, I hear a lot about partnerships where "over-the-top" services like Facebook or Spotify talk about partnerships with carriers to attract new customers. It always seems a bit like throwing a sop to the carriers, who are perpetually disgruntled about the free services that ride on their dumb pipes. "If we do something that's good for the world we'll find a way to profit from that." Kirkpatrick: "Is your board completely cool with that?" Zuckerberg: "Yeah, they're on our board because they believe in our mission." Next question: What kind of trajectory will this follow? How long will it take before everyone can have "basic services." Zuckerberg: "I hope that we can prove that the model works, and then get to the place to work with a larger number of carrier partners within the next two or three years." Pretty sure we've heard this one before. "This is a long-term thing for us..." But, he hopes to do well better than a billion people over the next five years. Back to the Whatsapp acquisition again. Kirkpatrick is asking whether the board was into the cost. Zuckerberg: "There's two pieces to think about: the first is the company by itself and what it's going to be worth, and then there's the strategic value of what we can do together." "Free Facebook" is a pretty common offer with Australian carriers and Australia is not a slow moving data user. Is it used that way in a many other Western nations too? That said, Australia uses data caps to restrict usage, so 'Free' anything is attractive when there are limits to worry about. He thinks that the company is worth $19B on its own, even without the partnership options. "Then the question is why were we excited to do this together." 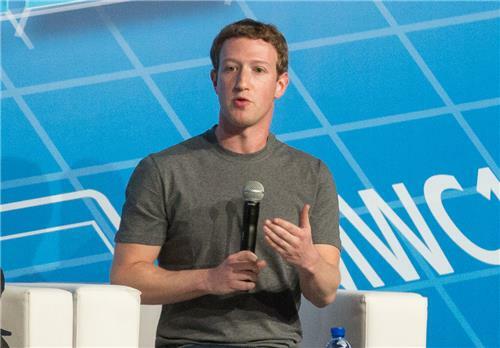 Zuckerberg is again saying about the internet.org angle, which he believe will help. Being a part of Facebook, he says, means they can really focus on adding more people. "What we envision for carriers, is basically a model that can help them get more subscribers and connect more people." Kirkpatrick is now asking for more specific information about efficiencies that can be gained to reduce cost. Zuckerberg says there are three aspects, with the first being to decrease the cost of the internet infrastructure. Basically, hardware and the necessary equipment to run it. Second is to increase data efficiency, so that services need less data, he says. Finally is increasing the efficiency of the up-sell. He says there's a 10x improvement to be made on all three tiers. Regarding the first point, Zuckerberg says that more spectrum availability would help, along with reduced costs of smartphones. Kirkpatrick references the $25 Mozilla smartphone that was announced today.